Glassboro, NJ, January 03, 2019 --(PR.com)-- Dr. Mary J. Gallant of Glassboro, New Jersey has been honored as a Woman of Distinction and with a P.O.W.E.R. Podcast by P.O.W.E.R. (Professional Organization of Women of Excellence Recognized) for her outstanding contributions and achievements in the fields of education and research. Each quarter P.O.W.E.R. chooses four women for their distinction award. These four noteworthy women deserve recognition for their exceptional accomplishments. They go the extra mile to achieve results and create a significant impact in their chosen profession. Dr. Mary J. Gallant is an Associate Professor of Sociology at Rowan University since 1992. She teaches Classical Social Theory, a core course for the Sociology major and the BA in Sociology, and a senior seminar course in the College of Humanities and Social Science titled Sociological Imagination. From 2007 to 2015 she served as Chair of Department. Mary Gallant’s first position was with a small liberal arts and sciences graduate school where she taught and developed grant proposals to support her own research and fund assistantships for graduate students. One of these research grants involved a community ethnography and in-depth interviews with Holocaust survivors who were still silent about the traumatic memories they could not forget. In the interviews they shared their experience of cruelty, hatred, and indifference, opening a window into the soul that inspires both grief and wonder. What they said left an imprint that is still sharp and clear in her memory. The Holocaust project was cut short by factors beyond her control, but she remained determined. In part it was the urgency these survivors felt to have others carry their memory forward that moved her in 1994 to present a paper at the World Conference of Holocaust Scholars and Survivors, called Errinerung und die Zukunft II in Berlin, GDR. Her paper was titled, “Children and Adolescents in the Holocaust: Effects of Trauma” and it carried their words to all who were assembled. Thousands of people from all over the world attended that colloquium -- survivors of the Holocaust, scholars and professionals from many walks of life. The colloquium went on from Germany to London and then Oxford. Her second presentation was on rescue during the Holocaust. The watershed from that world conference alone had an exceptional effect on her presentations and publications for many years thereafter. In 2000, after the conference, Remembering for the Future (RFTF) at the University of South Florida, Palgrave published a three volume work edited by John K. Roth and Elisabeth Maxwell under the title, Remembering for the Future; The Holocaust in an Age of Genocide in which Dr. Gallant has a book chapter, “Social Dimensions of Rescue in the Holocaust,” Volume 2:254-270. 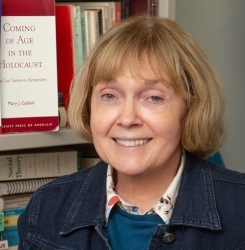 More recently Mary contributed another book chapter, “The Kindertransport: Gender and the Rescue of Jewish Children 1938-39,” in a volume out of the University of Washington Press edited by Myrna Goldenberg and Amy H. Shapiro titled, Different Horrors, Same Hell; Gender and the Holocaust (2013). As a dedicated academic, among her greatest concerns is the growth of conflict and violence worldwide. She is a Holocaust scholar and teacher with an awareness of the Holocaust as a turning point in the lives of millions of European Jews (1933-1945). Her latest efforts in post-Holocaust research focus on the new antisemitism and what surviving genocide means globally for individuals and their families caught up in chaos. Some highlights of Dr. Gallant’s published work include her first book, “Coming of Age in the Holocaust: The Last Survivors Remember” [ISBN-7618-2403-0] in 2002. It compared aspects of the survival process as emerging from the caring and ingenuity of survivors themselves while under captivity and abuse. Since effective teaching and earnest engagement of students is a life goal for her, she mainly prepared this book as one of the monographs for the course, Sociology of the Holocaust. At the time, this course was proposed as new curriculum by Rowan University for students in the general B.A. program and the Coordinate major in the then Education Department. In connection with her second research focus, Dr. Gallant has a book soon to come out on the US market titled, "Friendship Networks in Medical School; A Network Analytic Approach to the Study of Social Solidarity" [ISBN 978-3-8465-4077]. The focus of the network research relates to the work of Emile Durkheim, a classical social theorist who importantly influences mainstream sociology at the present time. Network analysis is an innovative way of thinking about society, holding great promise for a clearer understanding of how social structure influences our actions and ameliorates social problems. In January 2018 Mary anticipated her new research on friendship networks and the uncertainty problem in medical school presenting a paper on it at an international social science conference in Singapore. Mary obtained a Ph.D. in Sociology from the University of Minnesota in December 1985. She is affiliated with the American Sociological Association and the Eastern Sociological Society. She was recently honored on the famous Reuters Billboard in Times Square in New York City. Mary is being honored on P.O.W.E.R. Radio with a Podcast. These radio shows are pre-recorded audio interviews which provide the opportunity to convey a message or story. It is a great way to increase exposure and market reach as they are promoted through social media. To listen to Ms. Gallant’s podcast go to www.soundcloud.com/user-498580759/mary-j-gallant-phd-power-podcast. In her spare time she enjoys nature walks, choral music, National Public Radio, J.S. Bach, and (backyard) bird-watching. For further information, contact www.rowan.edu.